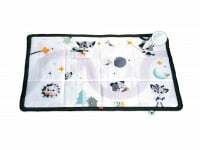 By 6-9 months, babies typically master the art of crawling; the home and immediate surroundings are now ransacked in and out, becoming a veritable "research lab" for the little explorer. Your baby is now no longer dependent on you for every last need and desire, so the newfound mobility makes for a critical juncture in your baby's odyssey toward independence. Being able to move from one place to the next brings out babies' curiosity, nurtures their drive to learn and explore and is a source of pride and a sense of achievement. 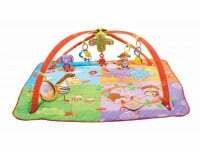 An environment well prepared for the mobile baby conveys an important message to your baby: your parents embrace your independence and are happy about your accomplishments. By contrast, an environment that spells out 'NO' at every corner, is a source of fear and inhibition. Maintain a fine balance, and create an environment for your baby that is at once safe and encouraging. By the end of the ninth month, babies can sit up independently, which frees their hands for play and exploration. The ability to move from crawling to sitting and then back to crawling opens up a whole new world of discovery: babies can now reach whatever peaks their interest, and then sit up and explore it with both hands. When they've had enough, they can simplymove on to the next challenge - babies are now freer and more flexible. 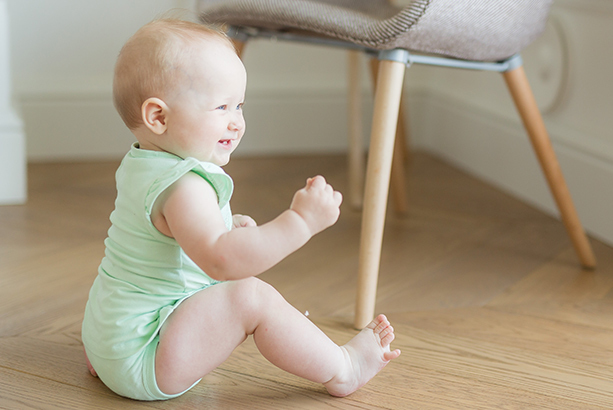 By the ninth month, many babies pull themselves up to a standing position by leaning on furniture, reaching for objects placed on it. Can now roll over in both directions and continues to rock back and forth and pivot. . Sits without support when put into that position or may be able to sit alone. It is not recommend to leave babies in a seated position for prolonged periods if they are not getting into it on their own. 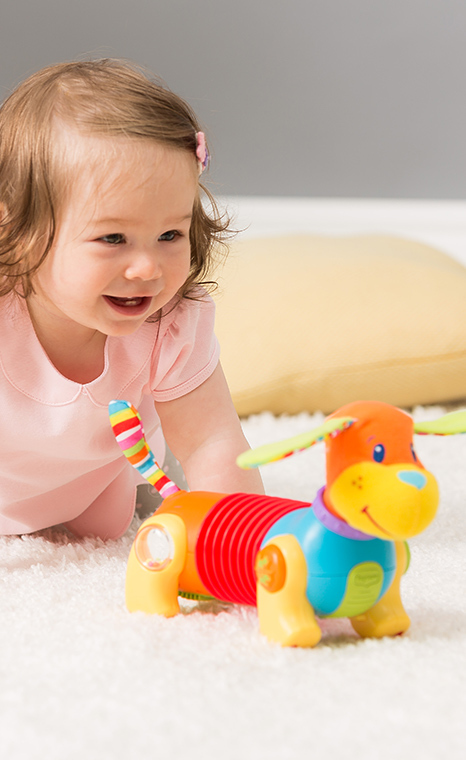 Shows the beginning signs of crawling and may later begin to crawl – either backwards or forwards. Coordination between two hands begins. May be able to clap her hands, or bang two blocks together. May be able to pull himself to a standing position, leaning on furniture. 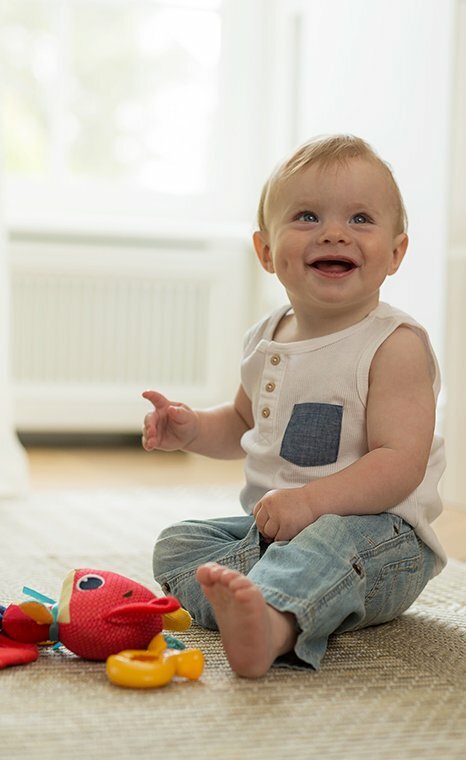 Dress your baby in comfortable clothing so it is easier to practice and perfect crawling techniques. If possible, do without socks, or if necessary, dress your baby in very thin socks. This helps her integrate the soles of her feet and toes in the crawling process. Offer toys that move forward slowly to encourage her to try and follow it.